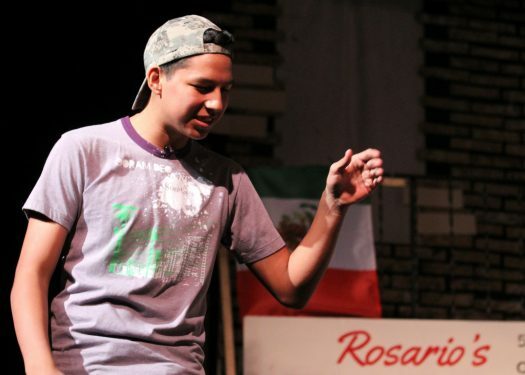 Bocho Villagomez acts during a December production of "In the Heights." Most of the students here at the school have grown up together. Each student has a close-knit group of friends that they have known since kindergarten. For Ambrosio Villagomez, better known as Bocho, making friends has never been a problem. Villagomez is a freshman here at Buffalo High School who moved from California in eighth grade, the time when most people’s friends’ group begins to fill up. However, that didn’t stop Villagomez from making many friends. Bocho has since moved up to high school, and even here he seems to have a friend around every corner. Villagomez has had no trouble making friends with students. Villagomez was also nominated and awarded the freshman representative spot on the homecoming court. According to friends, they really weren’t that surprised when they heard he had won. Even after all this, Villagomez has participated in multiple sports and activities including football, basketball, and theatre. Villagomez may be popular and all about living in the moment, but he has a goal in life and is working to reach it.